One of the core features of SNOW is to provide users the tools necessary to make amazing videos. SNOW is a game about self expression and there's no better way of doing that than by making an edit to show off what you get up to on the mountain. When we launched on Early Access we didn't provide the user with any tools that would help them achieve this, but over time have slowly added new features to the game to support the talented film makers in the community. Even before launching the Closed Beta I have been blown away by the quality and dedication some of our users have shown in their abilities to get amazing shots, even when the game doesn't help them in any way. With the Closed Beta update (0.5.0) we set out to give users the most significant tool for making videos: the Replay Manager. This feature allows users to rewind their session and watch it again from different angles including first-person and a "free-cam" that can be positioned anywhere or used for tracking shots. 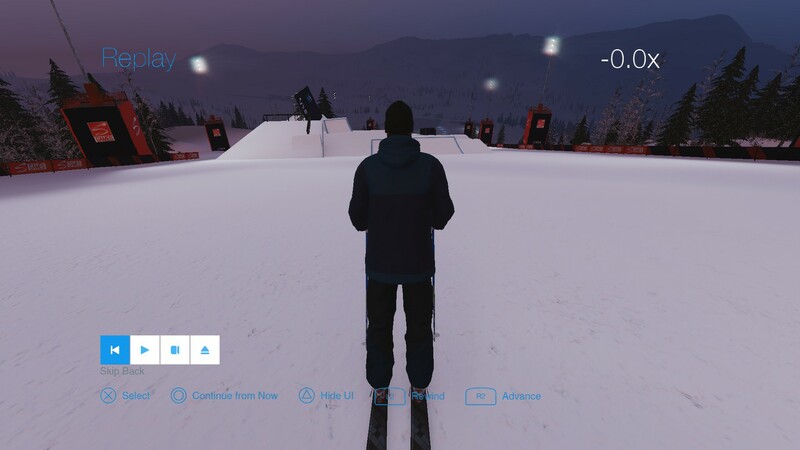 Obviously there are features still missing (like camera lens/filter control, or being able to place many cameras and interpolate between them) but for now we think the Replay Manager should help users a lot as they no longer have to focus on riding while getting the perfect shot. What is currently missing though is a proper guide to using the Replay Manager. Some controls are not clearly listed on the HUD and some controls are still hidden as console commands. So, with this post I wanted to outline a few controls to help all users make the best videos possible. The following controls are available on keyboard and gamepad. Playback Speed: In the top right corner of the HUD you can see the playback speed. This readout will change depending on how fast the playback speed is (when scrubbing) or how fast it's set to (when using normal playback). Scrub Forward / Backwards: Scrubbing allows you to quickly move through the timeline to find the exact point you want to start from. Use Q/E or LT/RT to scrub backwards and forwards (hold Shift on keyboard to increase speed to 8x). Using a gamepad also allows you to scrub very slowly, if held lightly. Increase / Decrease Playback Speed: For regular playback (using Play/Pause button) you can use A/D or LB/RB to increase the playback speed (you'll notice the playback speed display increase and decrease in small steps). When you hit play (clicking/pressing A on the Play icon) the replay will play back from that speed. This allows you to control the camera freely while the replay plays back at a desired speed. Hide / Show HUD: You can hide the HUD by pressing Tab or Y. Lock / Unlock Free-Cam: When using the Free-Cam (3rd camera option) you can lock / unlock it's position with G or X. When locked in place you can use the timeline controls as usual. When unlocked, you can use the following controls to move the Free-Cam around. cl_camDetachedFieldOfView 90: Changes the Field of View of the Free-Cam. Lower values look more "cinematic"
cl_camDetachedRotationSpeed 0.004: Changes the Look Speed of the Free-Cam. cl_camDetachedSpeed 0.2: Changes the Movement Speed of the Free-Cam. Combining lower camera look and movement speeds with a higher field of view and well place camera angles will allow you to get the exact shots you want. As we continue to develop the Replay Manager and add more features to it, I'll be sure to update this post with more information. Why havnt i gotten an invite code yet?